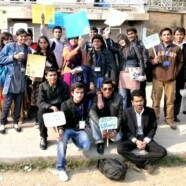 A clean up rally organized by Earth Watch Club (EWC) walked across the campus expressing their concerns about environmental littering and keeping FCC clean on 11 January 2012. Like previous activites such as trash pick ups, this rally also aimed at spreading awareness about the harms of littering our surroundings. It was particularly targeted at student’s attitude of littering on campus without any hesitation.